We are still in Antigua where we will stay through Christmas. We have finally repaired our refrigeration which died on the way here. The problem was a 12 volt motor that quit after 17 years of near continuous use. First we tried having it rebuilt but they couldn't do that here, so we ordered a new one (they are still being made!, whew) from the States and had it shipped here. It was a great lesson in Island Time. We were able to retain about half the food we bought at Costco in Norfolk for about ten days (with Ice purchased daily). Ed's wife Nancy arrived last night after a two day flight from San Diego, complete with a night in the Atlanta airport (the hotel was booked :( ). Ed rented a car to pick up Nancy at the airport, so we used it yesterday to replace the food we lost from the freezer, and today we'll take a motorized tour of the island with a hoped for swim/picnic at one of the beautiful white sand beaches around the island. Antigua has a huge Christmas party at Nelson's Dockyard in English Harbour which we have heard about from literally everyone we speak with, so that is on our agenda after a dinner ashore on Christmas Eve. Then we'll sail direct to St. Lucia which should take a day and a half, where we'll stay until we fly back to San Diego for niece Ashley's wedding, and a re-taste of some cold weather! Ed, and Nancy will stay aboard until their flights home on the 30th. Alli has yet to decide when, if ever, she's flying home. Moonshadow is looking festive below decks with the Christmas tree left behind by George and Merima, and some carefully selected ornaments we separated from the herd before leaving San Diego. 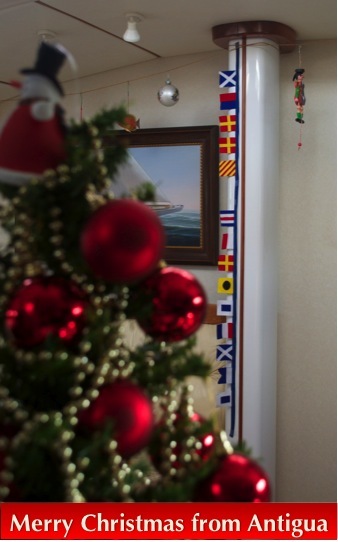 Included in our cruising collection of Christmas ornaments are the "First Christmas" ornaments for each of the boys and grand kids, and the "Merry Christmas" signal flags given us years and years ago by dear friends Jeff and Annie. These flags have flown in all of our homes, so the tradition continues!